dbForge Documenter for MySQL is a handy MySQL and MariaDB documentation tool that automatically generates documentation of an entire MySQL database in HTML, PDF, and MARKDOWN file formats. dbForge Documenter for MySQL is a handy MySQL and MariaDB documentation tool that automatically generates documentation of an entire MySQL database in HTML, PDF, and MARKDOWN file formats. The tool allows users to customize the generated documentation up to their needs with help of a bunch of options and settings. With dbForge Documenter for MySQL, you can document as many MySQL databases, as you want, and save time for more vital tasks.The key functionality of the tool includes the following features:1) Database structure from A to Z .dbForge Documenter for MySQL extracts an extensive database info about all MySQL objects, including their details, properties, SQL script and inter-object dependencies.2) Rich customization options.Documenter supports a selection of individual database objects and their properties that will be documented. The tool also contains a rich set of style templates and themes for fine-tuning of the document layout.3) Support for multiple file formats.dbForge Documenter for MySQL can generate documentation in the HTML, PDF, and MARKDOWN file formats. What is more, the documentation files generated in any of the formats is searchable.4) Object annotations.With the COMMENT properties supported, users can add annotations to every MySQL object.5) Navigation through documentation file.Documenter for MySQL allows users search across the generated documentation for database objects in a flash. For instance, the tool highlights all items matching the text a user is looking for. Also, Documenter offers handy navigation throughout the documentation via the built-in breadcrumbs.6) Automatic database documenting.With support for the command line interface, dbForge Documenter for MySQL allows setting up automatic database documenting. In addition, the tool includes the option to create a command line execution file to run routine database documentation tasks in a single click. SqliteLobEditor: Edit SQLite LOB (BLOB, CLOB (TEXT, NTEXT)) data. 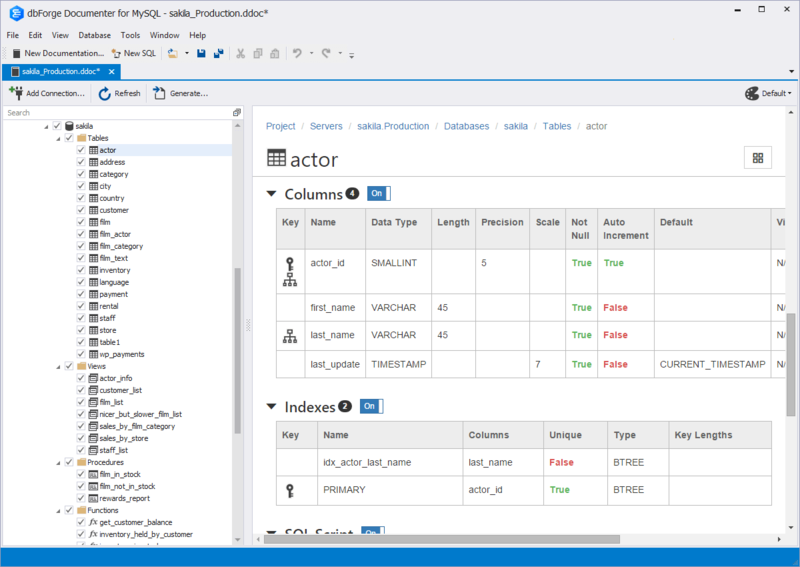 SqliteLobEditor is a database tool that helps DBA and Database Programmer edit SQLite LOB (BLOB, CLOB (TEXT, NTEXT)) data directly. It can import/export LOB data also.